Piaropus crassipes , (Mart.) Raf. The fruit is a thin-walled capsule enclosed in a relatively thick-walled hypanthium developed from the perianth tube. Mature seeds can number 450 per capsule, are 4 x 1mm, with an oval base and tapering apex. The coat has 12-15 longitudinal ridges (Gopal 1987, in Batcher Undated). A useful resource on the spread, impact and control of water hyacinth is: M.H. Julien, M.P. Hill, T.D. Center and Ding Jianquig (eds.). Biological and Integrated Control of Water Hyacinth Eichhornia crassipes (Proceedings PR102 2001). In China the weed was widely used as animal food from the 1950s to the 1970s. As at that time, the economy in rural areas was very depressed and there was great shortage of food for animals. It was also used for fertiliser in a few areas. Since the end of 1980s the use of water hyacinth has fallen greatly and its sole use now is for feeding ducks and as a test plant for the purification of polluted water (Jianqing et al. 2001). Growth by water hyacinth is largely exuberated by nutrient rich waters, particularly those rich in nitrogen, phosphorus and potassium (FAO Undated). Originating from the tropical regions of South America, this weed exhibits frost sensitivity (Biosecurity New Zealand Undated) and does not tolerate brackish water (Holm et al. 1977). Salinity can limit or modify its distribution (for example, in the coastal lagoons of West Africa, where water hyacinth accumulates during the wet season and is reduced to saline regions during the dry season). Vegetative reproduction is more important. 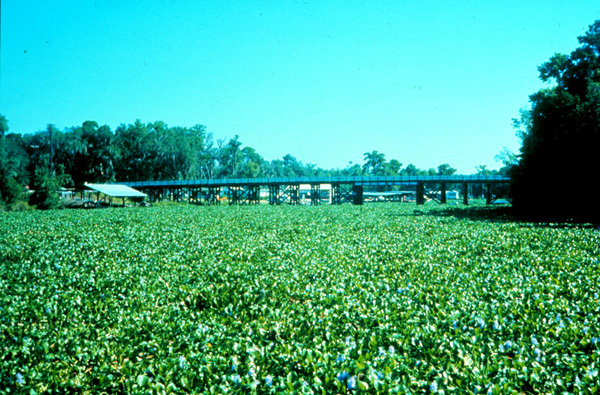 Water hyacinth grows and spreads rapidly under favourable temperature and nutrient conditions (Batcher Undated). Stolon buds develop that bear offshoots from axillary buds and stolons are readily distributed by water currents, winds and boat traffic. 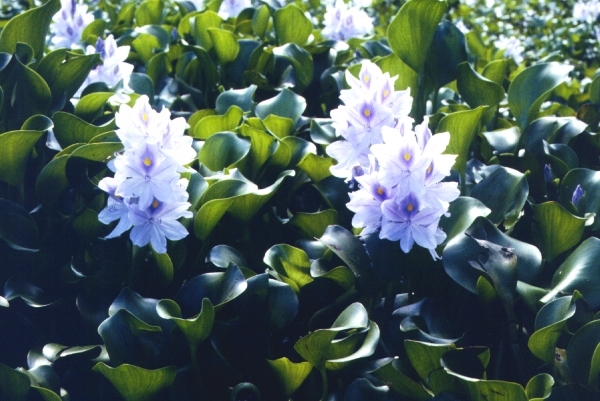 In the 1950s and 1960s, water hyacinth was distributed widely into almost all provinces in China for animal food. After artificial transplanting and mass rearing and breeding, water hyacinth was distributed to further areas in the 1970s (Jianqing et al. 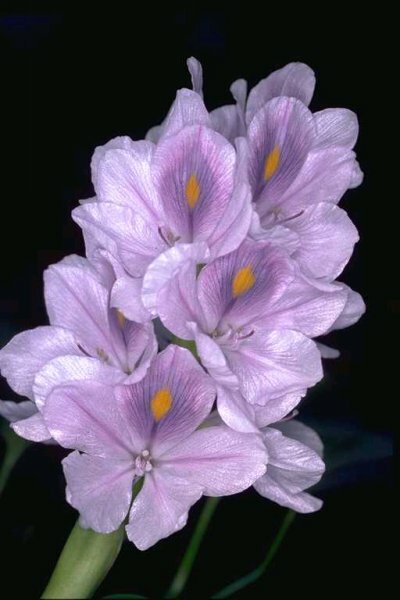 2001).Water hyacinth has an attractive purple flower which has made it a favourite amongst ornamental pond and botanical garden enthusiasts. 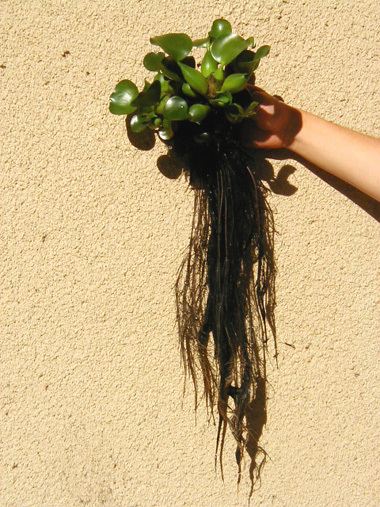 As a result humans have spread it widely and due to its fast growth rate it now flourishes in all continents but EuropeMost spread can be attributed to deliberate planting of water hyacinth in ponds or dams as an ornamental, or use in aquariums. 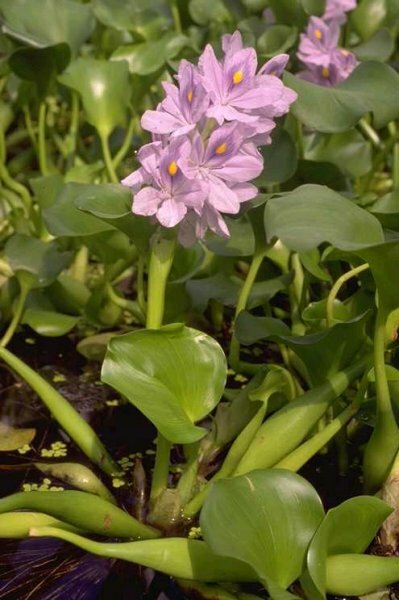 Unwanted plant material is discarded into creeks, rivers and dams is a major mode of dispersal (Burton 2005).Water hyacinth has an attractive purple flower which has made it a favourite amongst ornamental pond and botanical garden enthusiasts. As a result humans have spread it widely and due to its fast growth rate it now flourishes in all continents but Europe (Lindsey and Hirt 1999, in Williams Undated).Seeds are translocated by machinery (Burton 2005). Recommended citation: Global Invasive Species Database (2019) Species profile: Eichhornia crassipes. Downloaded from http://www.iucngisd.org/gisd/species.php?sc=70 on 22-04-2019. E. crassipes has a detrimental impact on water use by humans. In drainage canals it reduces the flow, which can result in flooding and damage to canal banks and structures. In irrigation canals it impedes flow and clogs intakes of pumps used for irrigation. Water flow patterns have been disrupted in utility cooling reservoirs. Water hyacinth interferes with navigation of both recreational and commercial craft, negatively impacting fisherman, sports-fisherman, water-skiers and swimmers in recreational waters. Limitations on water use can reduce real estate values and tourism (Batcher Undated). Economic losses may be the result of attempts to control the weed. Manual removal of the weed in China alone cost an estimated 100 million RMB yuan (US$12m) each year but was neither economic nor effective (Jianqing et al. 2001). Control strategies must address both watershed management (to reduce nutrient supply) and direct weed control (eg: by introduction of biological control agents) (FAO Undated). Nutrient run-off into infestations should be minimised. Heavy nutrient loadings in water come from erosion of cultivated land, cattle yards, domestic and municipal sewerage outfalls and wastewater discharges from factories. This nutrient inflow can be reduced or prevented by treating water before discharging it into waterways (Burton 2005). \r\nPreventative measures: A Risk assessment of Eichhornia crassipes for Australia and the Pacific was prepared by Pacific Island Ecosystems at Risk (PIER) using the Australian risk assessment system (Pheloung, 1995). The result is a score of 14 and a recommendation of: reject the plant for import (Australia) or species likely to be a pest (Pacific). Informations on Eichhornia crassipes has been recorded for the following locations. Click on the name for additional informations. Batcher, Michael S. (no date) Element Stewardship Abstract for Eichhornia crassipes (Martius) Solms. The Nature Conservancy, Virginia, USA. Summary: Contains names, description, diagnostic characteristics, pest weed status, references and a stewardship summary that includes information on habitat, ecology, biology, impacts, management, monitoring, research. Collins, J.N, May M, Grosso C. 2003. Water hyacinth Eichhornia crassipes. Practical Guidebook to the Control of Invasive Aquatic and Wetland Plants of the San Francisco Bay - Delta Region. Available from: http://legacy.sfei.org/nis/hyacinth.html [Accessed 22 May 2010]. Fayad, Y.H., Ibrahim, A.A., El-Zoghby, A.A. and Shalaby, F.F. 2001. 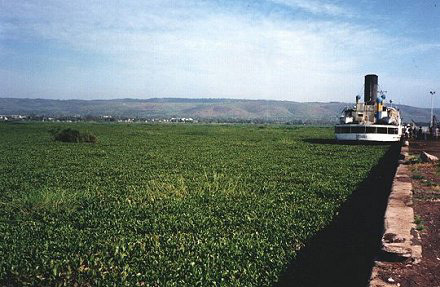 Ongoing Activities in the Biological Control of Water Hyacinth in Egypt. In: M.H. Julien, M.P. Hill, T.D. Center and Ding Jianquig (eds.). Biological and Integrated Control of Water Hyacinth Eichhornia crassipes (Proceedings PR102 2001). Florida Department of Environmental Protection (FDEP). Undated. 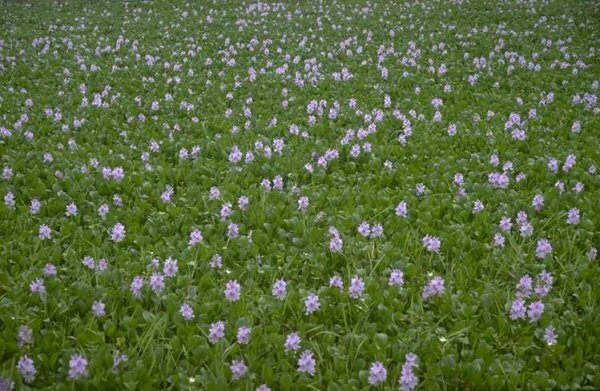 Weed Alert: Water Hyacinth: Eichhornia crassipes. Bureau of Invasive Plant Management. Hill, M.P. and Olckers, T. 2001. Biological Control Initiatives against Water Hyacinth in South Africa: Constraining Factors, Success and New Courses of Action. In: M.H. Julien, M.P. Hill, T.D. Center and Ding Jianquig (eds.). Biological and Integrated Control of Water Hyacinth Eichhornia crassipes (Proceedings PR102 2001). Jianqing, D., Ren, W., Weidong, F. and Guoliang, Z. 2001. Water Hyacinth in China: Its Distribution, Problems and Control Status.In: M.H. Julien, M.P. Hill, T.D. Center and Ding Jianquig (eds.). Biological and Integrated Control of Water Hyacinth Eichhornia crassipes (Proceedings PR102 2001). Julien, M.H. 2001. Biological Control of Water Hyacinth with Arthropods: a Review to 2000. In: M.H. Julien, M.P. Hill, T.D. Center and Ding Jianquig (eds.). Biological and Integrated Control of Water Hyacinth Eichhornia crassipes (Proceedings PR102 2001). Julien, M. H. (ed.) 1992. Biological control of weeds: A world catalogue of agents and their target weeds (3rd edition). CAB International, Wallingford, UK. pp. 77-82, 126, 135-136. Summary: Rapport technique pr�sentant les enjeux de la lutte biologique contre la Jacinthe d eau et la Laitue d eau � la R�union et les diff�rentes �tapes du programme. Moorhouse, T.M., Agaba, P. and McNabb, T.J. 2001. Recent Efforts in Biological Control of Water Hyacinth in the Kagera River Headwaters of Rwanda. In: M.H. Julien, M.P. Hill, T.D. Center and Ding Jianquig (eds.). Biological and Integrated Control of Water Hyacinth Eichhornia crassipes (Proceedings PR102 2001). Navarro, L.A. 2001. Water Hyacinth Information Partnership for Africa and the Middle East. In: M.H. Julien, M.P. Hill, T.D. Center and Ding Jianquig (eds.). Biological and Integrated Control of Water Hyacinth Eichhornia crassipes (Proceedings PR102 2001). Pacific Pest Info No. 51, August 2004. ISSN: 1728-5291. Secretariat of the Pacific Community, Plant Protection Service. Photos and additional information at University of Florida, Center for Aquatic and Invasive Plants. Raulerson, Dr. Lynn,. pers. comm. 2006. University of Guam (Biology). From information collected by David E. Gee II, Wildlife Biologist. Guam Division of Aquatic & Wildlife Resources and Guam team member of the Pacific Invasives Learning Network (PILN). Room, P.M. and Fernando, I.V.S. 1992. Weed Invasions Countered by Biological Control: Salvinia molesta and Eichhornia crassipes in Sri Lanka, Aquatic Botany 42: 99 - 107. Summary: This paper gives an excellent outline of the biological control of S. molesta in Sri Lanka between 1982 and 1990, including a history of the weed in the country, an overview of the release and distribution of the weevil (Cyrtobagous salviniae) and an summary of the results and most interesting findings. Also mentions the performance of Neochetina eichhorniae as a biological control agent for water hyacinth (Eichhornia crassipes). The Nation (Nairobi) March 25 2004. Local Scientist Patents Hyacinth Processing Machine. Dan Teng o Nairobi. Summary: Available from: http://allafrica.com/stories/200403250465.html Accessed on 10:18 AM 3/29/2004]. The Nature Conservancy photos and Stewardship Abstract. Waterhouse, D. F. 1994. Biological control of weeds: Southeast Asian prospects. Australian Centre for International Agricultural Research, Canberra. p. 68-83. Waterhouse, D. F. and K. R. Norris. 1987. Biological control: Pacific prospects. Inkata Press, Melbourne. p. 332-341. Williams, A.E. Undated. Water Hyacinth (Eichhornia crassipes). University of Waterloo (Canada) and FIRRI (Uganda) Collaborative Project. Brendonck, L., Maes, J., Rommens, W., Dekeza, N., Nhiwatiwa, T., Maxwell, B., Callebaut, V., Phiri, C., Moreau, K., Gratwicke, B., Stevens, M., Alyn, N., Holsters, E., Ollevier, F. and Marshall, B. 2003. The impact of water hyacinth (Eichhornia crassipes) in a eutrophic subtropical impoundment (Lake Chivero, Zimbabwe), Arch. Hydrobiol. 158(3): 389 - 405. Burton, J. 2005. Water hyacinth Eichhornia crassipes (Agfact P7.6.43). New Department of Primary Industries. Department of Environmental Affairs and Tourism. 1999. National State of the Environment Report - South Africa: Fresh Water Systems and Resources: Impacts. Don, L.D. 2005. Asian-Pacific Alien Species Database. Flora of the Marquesas. Undated. Holm, Leroy G., D. L. Plucknett, J. V. Pancho, and J. P. Herberger. 1977. The world�s worst weeds: Distribution and Biology. East-West Center/University Press of Hawaii. pp. 72-77. Information from the Purdue University NewCROP web site. Information on the Weeds in New Zealand web site. Marchante, H. 2005. Invasive plant species in Portugal. In: Brunel, S. (Ed.). 2005. Invasive Plants in Mediterranean Type Regions of the World (Plantes envahissantes dans les r�gions m�diterran�ennes du monde). Proceedings of the International Workshop (Actes de l�atelier de travail international). Council of Europe Publishing. Natural Research Conservation Service (NRCS). Undated. Plants Profile: Eichhornia crassipes. United States Department of Agriculture (USDA): Natural Research Conservation Service (NRCS). Oudhia, P., 2001.Traditional medicinal knowledge about a noxious weed, jal kumbhi (Eichhornia crassipes), in Chhattisgarh (India). Summary: Uses and notes on Eichhornia crassipes in India. Available from: http://aquat1.ifas.ufl.edu/aq-w01-22.html [Accessed on March 9, 2004]. Parsons, W. T. and E. G. Cuthbertson. 1992. Noxious weeds of Australia. Indata Press, Melbourne/Sydney. p. 139-144. Photo and additional information at the University of Guam Plants of Guam web site. Plants for a Future. 2004. Eichhornia crassipes - (C.Mart.) Solms. Water Hyacinth. Rao, V.S. (1988) Principles of weed science. Oxford and IBH Publishing Co. Pvt. Ltd., New Delhi (India), 544 pp. Schanzer, L.A., Shvetsov, A.N. and Ivanov , M.V. 2003. Eichhornia crassipes and Pistia stratiodes are Spreading in Ponds and Rivers of Moscow and Moscow Region, Biological series 108(5). Stone, Benjamin. 1970. The flora of Guam. Micronesica 6:116. University of Florida. 1997. Water hyacinth: Eichhornia crassipes. Institute of Food and Agricultural Sciences (IFAS): Center for Aquatic Plants. University of Florida. 2001. Biological Control Of Invasive Plants. Institute of Food and Agricultural Sciences (IFAS): Center for Aquatic Plants.